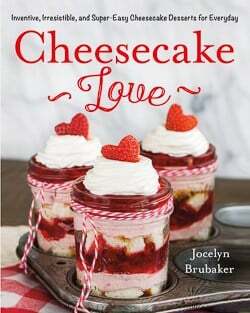 Craving something sweet but don’t want to indulge too much? 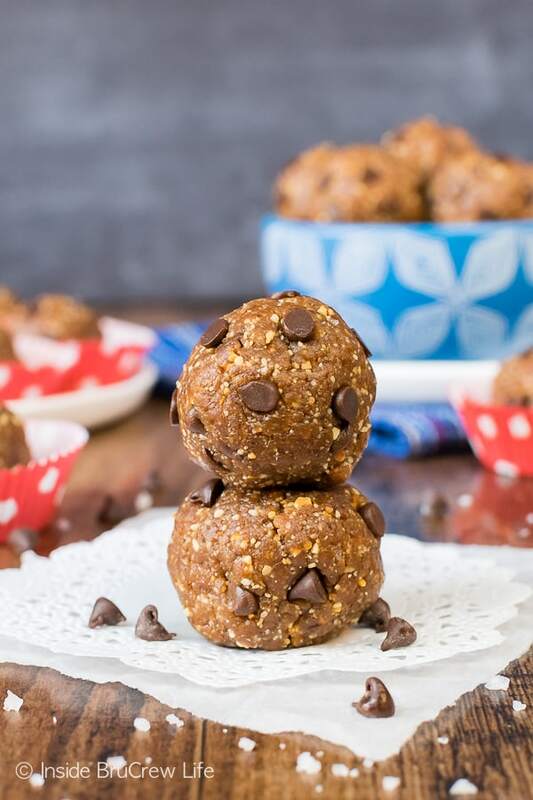 Keep a batch of these Healthy Peanut Butter Chocolate Chip Bites in your refrigerator for when those sweet cravings hit. 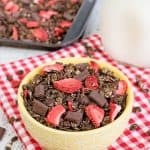 These nutritious homemade energy bites are perfect for when you want a healthy snack. I don’t know about you, but after three weeks of spring break fun I’m ready to get back to some good old healthy eating. Time to plan out some healthy dinner ideas and get back in our garage gym. Yes, you read that right. We just finished up three full weeks of visitors, traveling, and eating all the things. To be honest, I was a little bit scared of the scale this morning because I did indulge in more things that I don’t normally eat. But I did try to work out some during those few weeks, so it really wasn’t as bad as I expected. The first week my sister and her family were here, so of course we had to hit up the local donut shop, order our favorite pizza, and make fun desserts like this Orange Cream Cheesecake. The second week our oldest was home from college for his spring break, so again more pizza and cheesecake happened. And then this past week for our other kids spring break, we flew to AZ with our oldest to enjoy some hiking and Arizona food. That week was full of pizza, ice cream, and burgers. Our spring break fun ended on Easter Sunday. After all the food we consumed in the past three weeks, we all agreed that a big plate of this Strawberry Orange Spinach Salad with Chicken was all that anyone wanted. This year we didn’t even do much candy. Although our youngest was adamant that he wanted a small basket and a big peanut butter egg, and of course, I couldn’t say no to his cute little face. 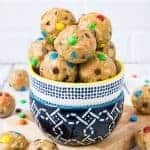 This week I want to do is fill our fridge with veggies, yogurt, and more of these Healthy Peanut Butter Chocolate Chip Bites. 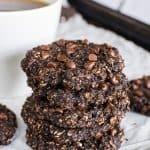 These little no bake energy bites can be made in 5 minutes and only take a few ingredients. They are perfect for popping right before a work out, eating as a mid afternoon snack, or as a late night snack. 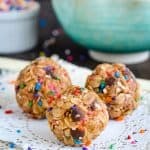 A batch of these Skinny Peanut Butter Granola Bites are another option that never seems to last very long in our house. You really can’t go wrong with either no bake snack. Well, unless you eat an entire batch in a day. They are also a great nutritious homemade snack for when you need to run errands. Keep a few of these healthy portable snacks in a bag and grab one as you run out the door. Place the peanuts in a food processor and pulse until they are fine. Do not over pulse though because it will become a paste very quickly if you are not watching. Remove the pits from the fresh dates before adding them to the food processor. If you are wondering how to remove pits from dates, use a small paring knife to slice lengthwise on the front of the fruit until you hit the pit. Pull the dates apart and remove the pit. 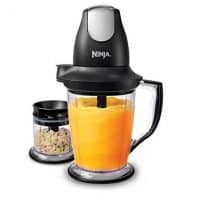 Add the dates to the food processor and pulse until the mixture forms a slightly paste. Again do not pulse too much because you do not want to make peanut butter. Stir in some mini chocolate chips and sea salt and form the mixture into small bite-sized balls. An optional step is to press a few more chocolate chips into the outsides of the balls. You can leave this step out if you want to cut some calories from the snack bites. 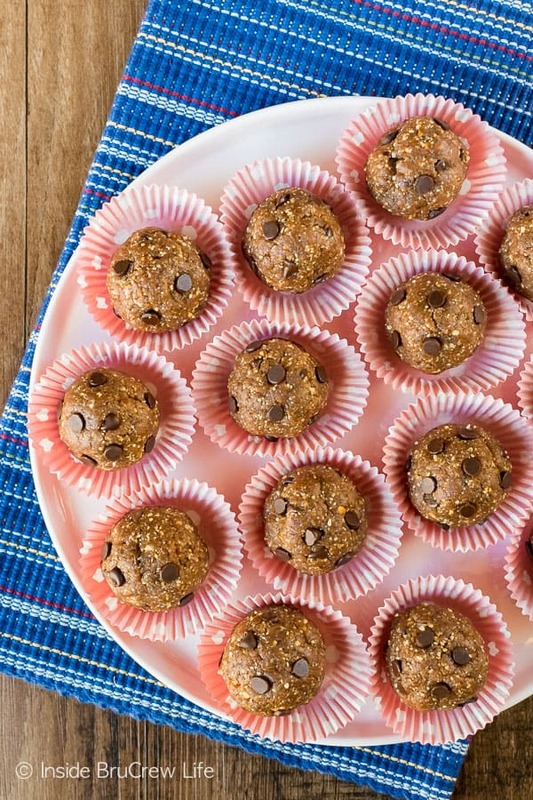 Store these Healthy Peanut Butter Chocolate Chip Bites in a paper towel lined container in the refrigerator for 1 week or freeze for 1-2 months. Although I guarantee that they won’t last that long once you taste them. A batch of this Superfood Healthy Trail Mix from Rachel Cooks would be great for taking on hikes or munching on late at night. 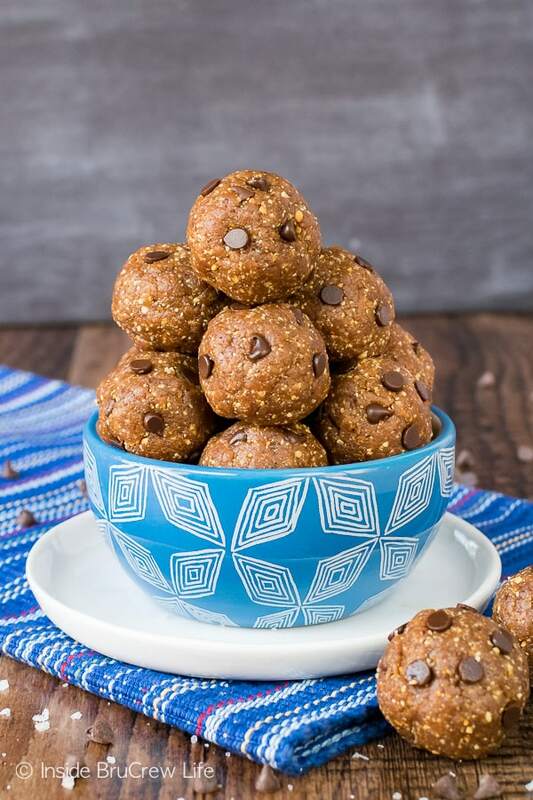 Make these Almond Joy Energy Bites from Inside BruCrew Life for a sweet yet healthy protein snack. 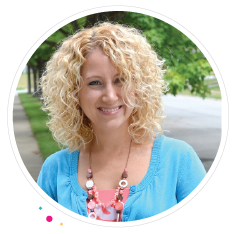 This Garlic Parmesan Roasted Chickpea Snack Recipe from Sugar Free Mom is perfect for those with nut allergies. Gotta love a crunchy snack that is good for you too. I know these No Bake Pumpkin Oatmeal Energy Bites from Bless This Mess would disappear in our house. Perfect for enjoying pumpkin treats all year long. 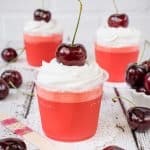 Craving something sweet but don't want to indulge too much? 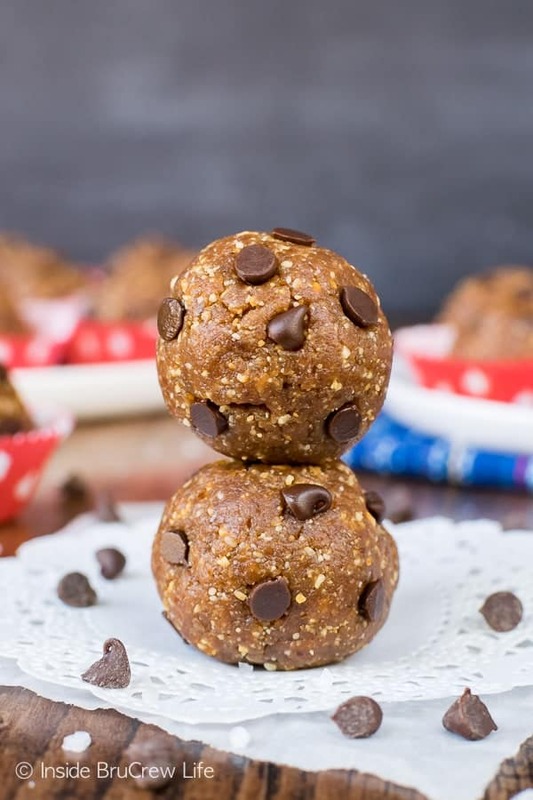 Keep a batch of these Healthy Peanut Butter Chocolate Chip Bites in your refrigerator for when those sweet cravings hit. 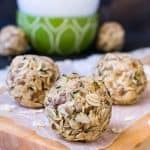 These nutritious homemade energy bites are perfect for when you want a healthy snack. Place the peanuts in a food processor and pulse until they are fine. Do not let it become a paste. Add the dates and pulse again a few times until the mixture holds its shape when you press it together. Stir in 2 Tablespoons of chocolate chips and the sea salt. Press and roll the mixture into 22 even balls. Press the remaining chocolate chips on the outsides of the balls. Store in a paper towel lined container with a cover in the refrigerator for up to 1 week or freeze for 1-2 months.